SQL AND, OR, NOT are being useful to apply some logic to conditions in the WHERE clause. This SQL Tutorial will give you tips with syntax on how to use these AND OR NOT operators in SQL to calculate one or more conditions together as a filter. So, let us see the syntax with some examples. The SQL AND operators filters and picks the rows for which all conditions are TRUE. On the contrary, the SQL OR condition processes the rows for which any one of the condition evaluates as TRUE. The NOT operator is known as the negation operator. When the condition is FALSE, the NOT expression becomes TRUE. 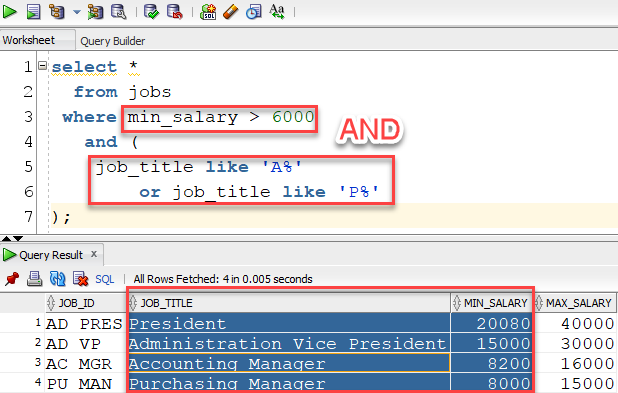 Note: This SQL Tutorial uses concept explained in SQL Statements, SQL Tables, SQL WHERE clauses. Please check those out so that you do not miss anything. Let us say we want to find out all the table names which are in HR owner and the name should contain the word JOB in it. So, How do you approach such a problem?  Please do not get scared. It is easy with SQL AND operator.  The steps would be as following. We need to select all the table names or table meta rows from the dba_tables table. Filter and select those rows who has owner HR and table name has JOB in it. Did you notice the word “and” in the last statement? Let us write the query now. Please refer to the screenshot below for the same. Please note both owner and job_name. As, both the rows satisfy the two conditions in the WHERE clause, those two rows are fetched. 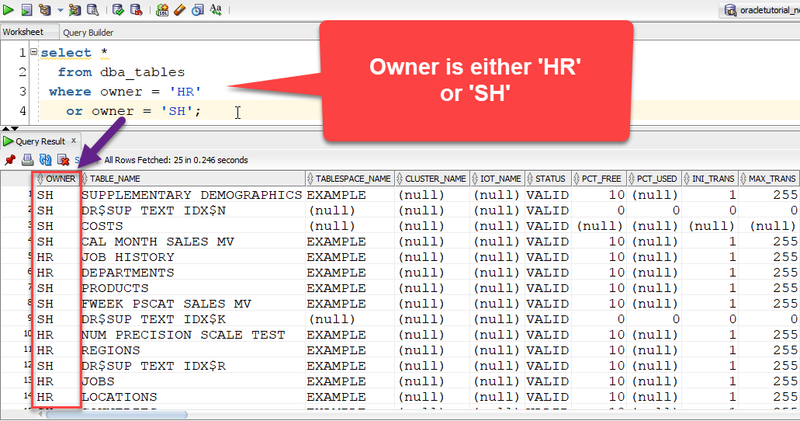 In this above query, we are trying to find out the table names which are either belong to HR or SH schema. Please refer to the image below. Let us say we want to list out the jobs except whose min_salary is less than 6000. So the query for the same would be as follows. 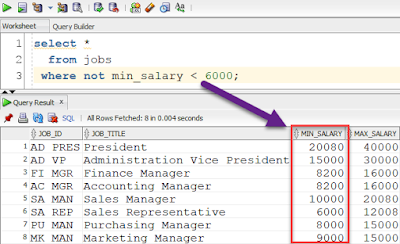 As we have told the SQL database not to select the rows which have min_salary less than 6000. 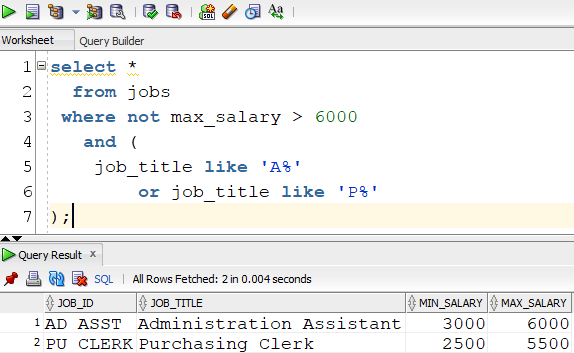 Hence, it selected all the rows with min_salary >= 6000. Here we are basically saying the database to fetch the jobs which have min_salary > 6000 and job title starting with A or P. So, the condition min_salary > 6000, job_title like ‘A%’ or job_title like ‘P%’ are two conditions for the AND operator. The job_title like ‘A%’, job_title like ‘P%’ are the two conditions for the OR operator. Please refer to the following screenshot. We can also use NOT along with AND, OR operators. Here is an example for the same as shown below.